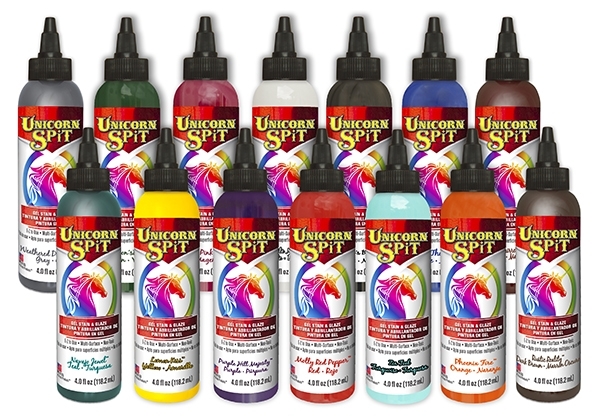 Unicorn SPiT's Gel Stain and Glaze in One™ stains deep into the bare wood grain, glazes over existing finishes, brightens and highlights chalk paint, and creates a 3 dimensional effect! Unicorn SPiT Gel Stain can turn ordinary furniture into a piece of art! It can also be used on fabric, metal, glass, laminate, concrete, pottery, wicker, in resin, and more! Colors can be as opaque or as vibrant as you desire....you can thin with water for a wash of color or use full strength. Jasmine scented, water based, non toxic and safe for indoor use....even by the kids!